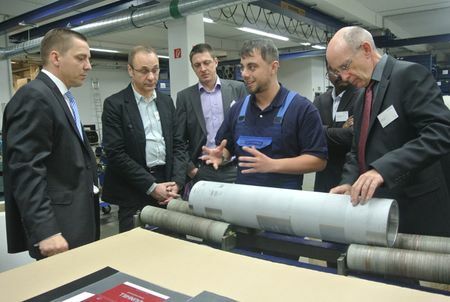 The second Innovation Day for security solutions included a company tour at the Kippenheim production site. Janoschka Academy is continuing its very successful Innovation Day performance. The third Innovation Day dealing with the topic „Tactile in 3D“ will take place on 20th September in Saxony/DE. After having hosted well attended Innovation Days for the tobacco and security market, the third Innovation Day will be dedicated to tactile 3D structures, a very interesting subject for the decor and packaging market likewise. Living surfaces, tactile decors, printed surface feel and the latest trends and innovations will be highlighted by internal and external decor specialists. Printed 3D or „hapticCELL“, the state-of-the-art workflow for engraving and embossing tooling, will be part of the agenda, and the live showroom will make it a real sensible topic. The third Innovation Day will take place close to the Janoschka Innovation Center based at the Sächsische Walzengravur/SWG at the Schloß Lichtenwalde close to Chemnitz. A plant tour at the Janoschka subsidiary SWG offers an insight into most modern print and embossing forme production with direct laser technology. Tel. : +49 7825 / 849 243.